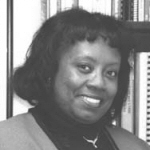 Angela Walton-Raji is a genealogist and researcher specializing in the Freedmen of Indian Territory. She is the author of Black Indian Genealogy Research, African Ancestors Among the Five Civilized Tribes and the co-publisher of VOICES of Indian Territory a scholarly journal with focus on the historical documents pertaining to the Freedmen of the Five Tribes. She has spoken at a number of national conferences and institutes throughout the nation, and her second book will be published by Heritage Books in early 2007. A native of western Arkansas, Ms. Walton-Raji earned a bachelor’s degree in Romance Languages from St. Louis University and a master’s degree from Antioch University. She works at the University of Maryland Baltimore County as Director of Graduate Recruitment, and continues to study, research and lecture on the history of Indian Territory Freedmen.